In the late 1960s a movement sprang up to promote civil rights for Catholics, in response to years of discrimination against Catholics in Northern Ireland. A particular centre was the predominantly nationalist city of Londonderry (known to Catholics as Derry). It was here that lives were lost in the ‘Bloody Sunday’ protest of 1972, when British troops opened fire on a crowd of demonstrators. 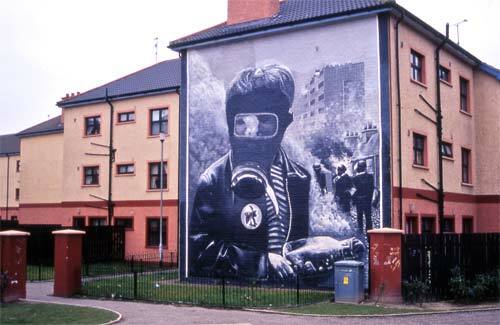 This mural, painted in 1994 in the Catholic Bogside area of the town, recalls those violent days. One spelling mistake! Irish people do not recognize Londonderry as Jim is probably well aware. Those who live in the six counties and identify as British would. I recognize the shared history people of all traditions and beliefs have on the island. What is this 4 million Irish people would not recgonise stuff? 1.5 million Irish people would recognize Londonderry. The question is, Does Jason recognize these Irish people as really Irish? Hope his maths are better than his spelling. The above Mural is in Derry, in the Bog Side and i have seen it many times, Iam staggered that the Caption Says Londonderry a place well over 4 million Irish people would not recgonise, but if you say Derry they would.